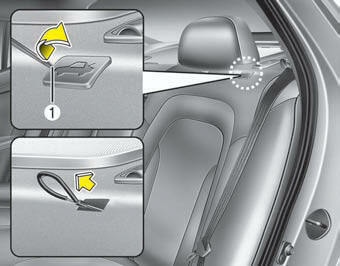 1.Take the cover out by putting the driver or key at left side. 2.Pull the hook of cable. 3. After use, securely close the cover. While driving the vehicle, Don’t use it. Unexpected problems could occur. When you open the cover, use certainly the driver or key. If you open the cover by your hand, this could result in damage or injury to your hand and finger. And then, when the cover is opened, keep the cover certainly. If there is the problem with trunk, have the vehicle checked and repaired by an authorized Kia dealer.